The last four days we have been under Arctic freeze conditions here in Colorado. I love it. After all this is why my husband and I jumped on the idea of moving from Houston. Most of y’all are thinking that I’m out of my mind enjoying frigid temperatures like what we’ve been having. As I write, it’s 7 degrees Fahrenheit outside and that’s an improvement on the 3 degrees just a couple of hours ago! I grew up in the wet and the cold of London. It feels like home when it’s cold and it IS winter time. The snow falls haven’t been the ones I like; the graceful large flakes that dance merrily down to the ground. We’ve had serious, small flakes that are here for business purposes only; the business of making driving and getting about impossible. Still; large or small, heavy or light, I enjoy watching the snow fall. 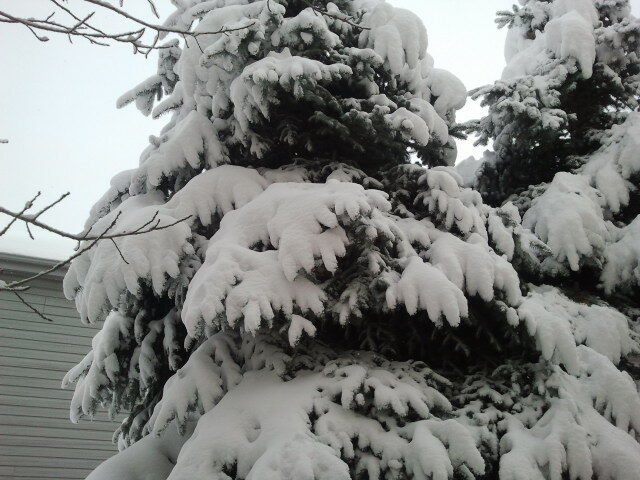 I love waking up to find my world under a white, fluffy blanket. This is our third snow storm already and we’re only in early December! Our first huge storm was back in October. 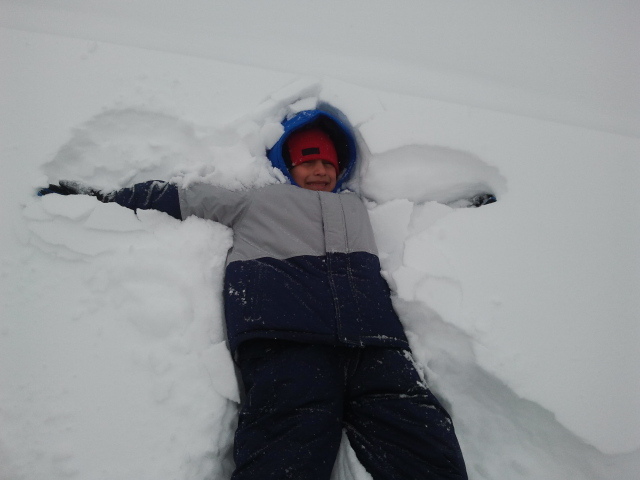 Apparently, we’ve already exceeded the snow values from last year! It’s going to be a long winter but I am ready, with my trusty Dutch oven, stock pot, crock pot and mittens. It’s been a busy few weeks for us. 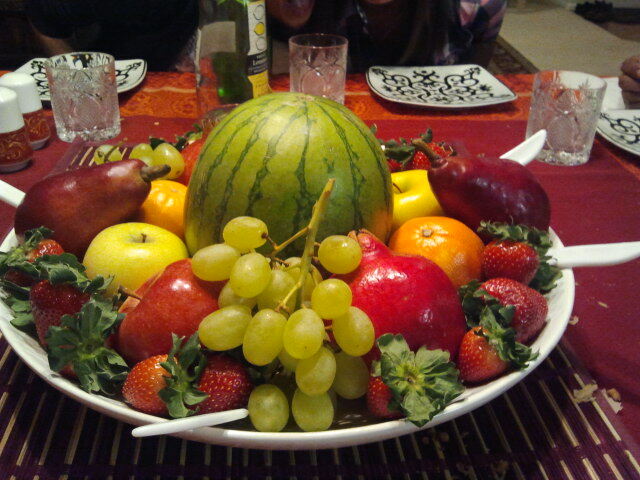 We had our Eid ul Adha celebrations and then there was Thanksgiving. I have recipes that I will post from Thanksgiving. We had a great time with too much food and great company. 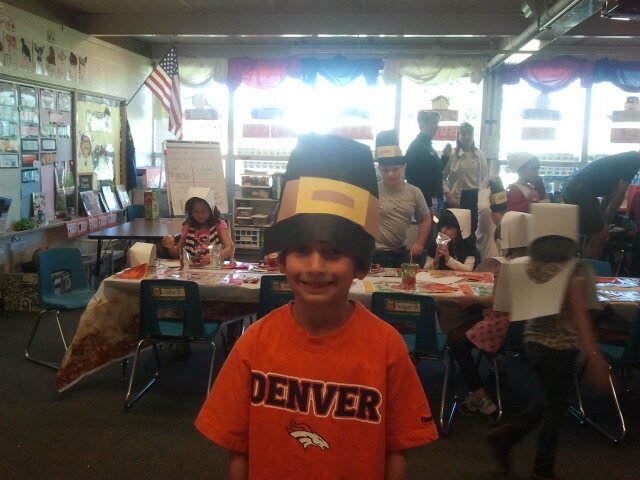 Laith had a Fall Party at his school and all the little kids in his class dressed up as pilgrims and enjoyed a pilgrim feast. They were so cute! 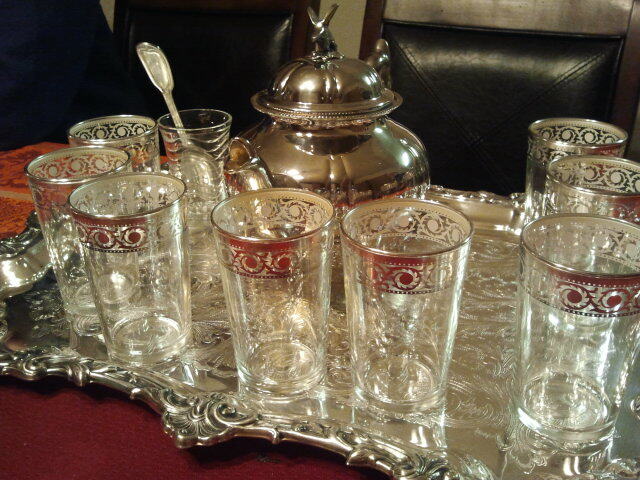 We also had an invite for a delicious Moroccan dinner, from my dear, new friend Andrea who happens to be from North England. We have hit it off famously and it’s really nice to have someone that understands “British”. Her husband is Moroccan and so she has learnt the recipes and techniques of Moroccan cooking. We had a fabulous time at their place and enjoyed the food and the hospitality, the following pictures show some of the evening’s delights. So, with these cold temperatures last night, we were in the mood for something hot and soothing that we could slurp and feel the warmth radiate down to our extremities. My chicken and dumplings hit the spot. 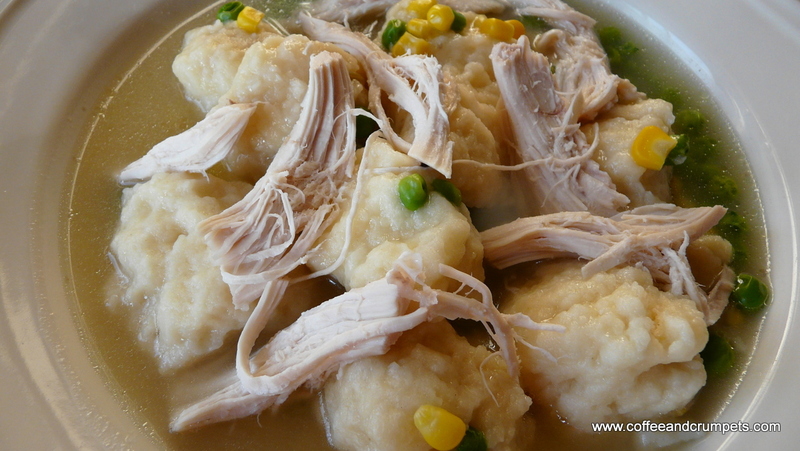 It’s a thick soup/stew and with the soft, pillowy dumplings and chunks of chicken, nice and substantial. The hot soup, which invariably burns my mouth, feels so good dribbling down the back of the gullet. It’s really easy to make. If you have leftover cooked chicken and broth, even easier. However, boiling a chicken with a few root vegetables and flavourings, and then de boning and using the broth, is fairly easy too. I just use a whole chicken, stick it in my pressure cooker with some vegetables and cover with water. Thirty minutes later, I have a cooked, tender chicken and flavourful chicken stock. This is a favourite of my children and hubby alike. They generally like soups and on a cold winter’s day, it’s a perfect supper. It can be made vegetarian by omitting the chicken and replacing the broth with vegetarian broth, however, I have to say, there is something very comforting about chicken soup. Put the whole chicken, vegetables, garlic, bay leaves, peppercorns into a large soup pot or pressure cooker and cover with the water and bring to boil. Cover and simmer until chicken is tender and the broth is flavourful. In a soup pot about and hour or more and in the pressure cooker, about 30 minutes. Strain the broth into a bowl or another pot. Let the chicken sit and cool before puling off the meat in shreds. Add the sliced carrots and let them soften. Meanwhile, make the dumplings. I heat the butter and milk in a microwave for about 3 minutes. the milk should be hot and the butter melted. In a large bowl, place the flour, baking powder and salt, and stir to mix. Add the hot milk-butter mixture and blend gently to combine. The mixture should be sticky but fluffy. Using 2 spoons, drop in spoonfuls of the batter into the boiling soup. Repeat till all the dumpling mixture is used up. Add the corn and peas and heat for about 5 minutes. Add the cooked chicken shreds and heat through. Make sure the dumplings are cooked through but still soft and fluffy and taste for salt and pepper. Serve in soup bowls and enjoy! Perfect for a cold evening and really good reheated as left overs. The next few days are forecast to be very cold again. I shall be digging up some more hearty, warming recipes. If they look good, I will share with y’all. I wish you all a very happy start to the holidays. It’s a busy season for shopping, cooking and baking. I know there are lots of fantastic things coming out of your kitchens. Send me a picture at coffeeandcrumpets@ymail.com and I will post up your delicious photos. I am hoping for some regular posting on my part. Things have settled down a bit now and I hope to start posting more than once a month! Thanks for reading and for your support. Have a great week and stay warm! I love to hear from my readers so please leave me a comment! If you enjoyed this post please share! Hi Nazneen! 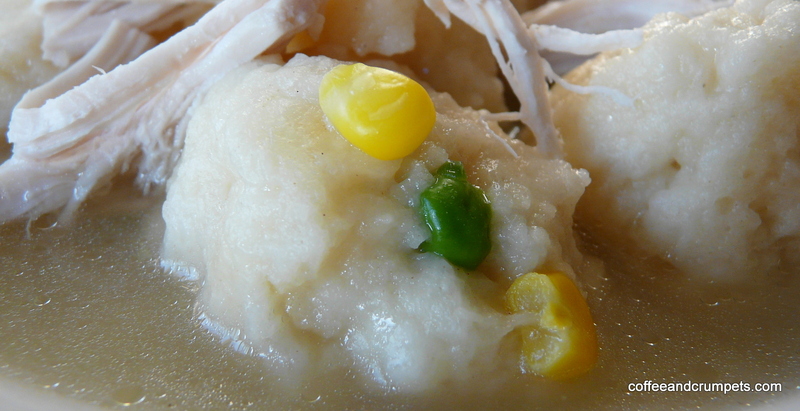 I have made this chicken and dumplings twice since I was reminded of it by your blog. 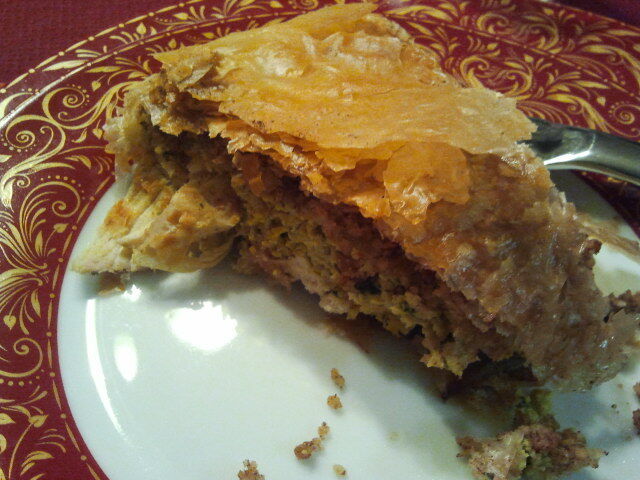 It is the most satisfying thing to eat in the Winter. We are having the leftovers tonight and I can hardly wait. It’s so tasty. Don’t you get a craving for it? I do and that’s why it’s made quite a lot at my house. I hope all is well with you Caterina and I wish you a very happy holiday season and New Year. Oh gosh, I dread winters!!! Snow like that would have me cowering under the duvet in seconds. 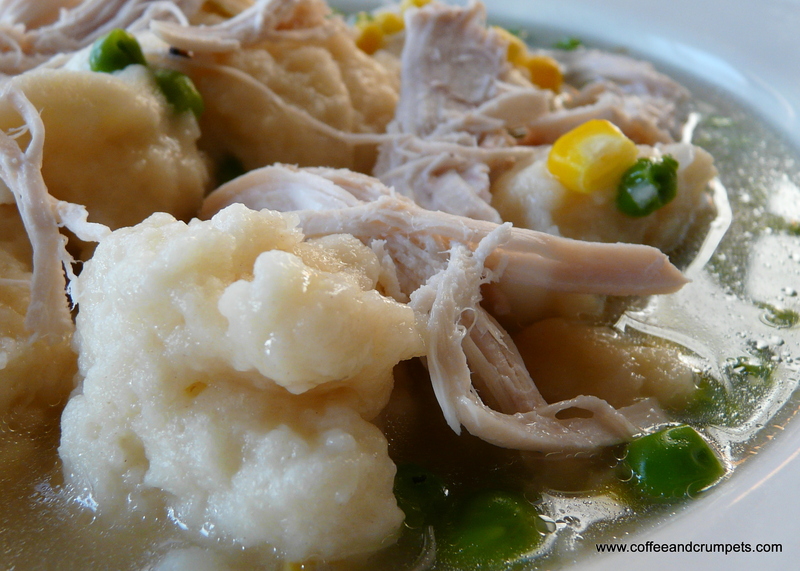 Comfort foods like your delicious looking chicken and dumplings is what gets me through it. You haven’t gotten used to the winters in England yet? I enjoy the cold and prefer it to searing hot temperatures. I enjoy eating in winter too because you can cook all sorts of comforting foods and have the oven on warming up the house and baking all sorts of goodies. And I too enjoy hiding under the duvet! Stay warm! Hey Nazneen looks and sounds amazing. Next time you make something consider putting it outside to freeze solid and then mailing some to us in the mail. By the time we get it, it should be good and thawed!! Just sayin 🙂 I will make this next week. 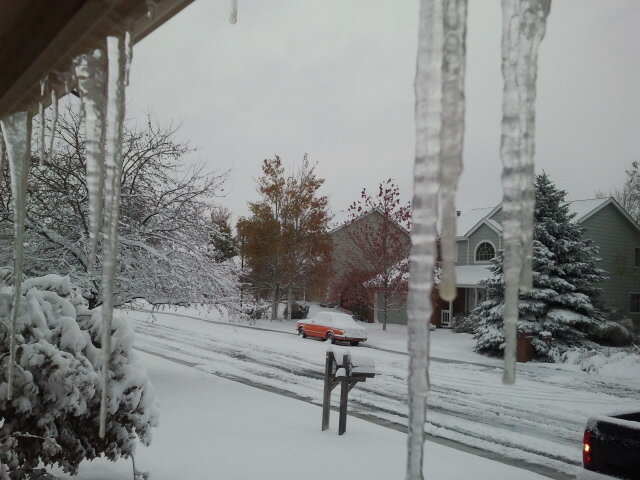 Its getting cold here, will go down to the 30’s tonight :0 don’t mean to rub it in although I do envy the snow a little. so this sounds perfect. Have never made it so will tell you how it turns out. Thanks, miss you, take care.